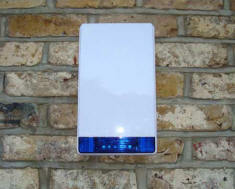 Electrical Services have developed the affordable non contract one off installation price for life Home burglar Alarm System that is fully wired and mains powered, our system has a external sounder with alternating LED's & a flashing strobe so your neighbors / commercial / industrial neighbors can see & here the activation of your alarm. MPS Burglar Alarms have gone one step further and incorporate a monitoring device which will allow you & your family to be notified when the system goes. MPS systems can cover up to eight zones or in layman's terms 8 separate rooms / areas, our systems can handle three separate remote keypads so you can activate or silence the burglar alarm upstairs, downstairs or even in the third floor if your home has one. MPS Burglar Alarm systems come with Viper window shock detectors, passive infra red internal movement systems, outer perimeter detection of your home along with door contacts. Electrical Services burglar alarm systems are fully monitored and we don not tie you down to a contract and monthly fee like some installers. Once you purchase my system it comes with a no quibble parts and labor three year guarantee and you own it for life. Check out some my monitored burglar alarm systems in Leeds,Wakefield, Harrogate,York,Bradford & Yorkshire.